Adding borders to a photograph can artfully complement it, making certain colors stand out and offering a more distinct and well-defined look. In case you plan to arrange a digital photo album for a photo sharing networks such as Picasa, Flickr or Facebook, adding borders to all images will provide a nice framing effect and give an extra artistic touch. Bordering or framing images is also extremely useful when you want to use them to design a website, because this feature helps highlight their content and distinguish them better from the background. 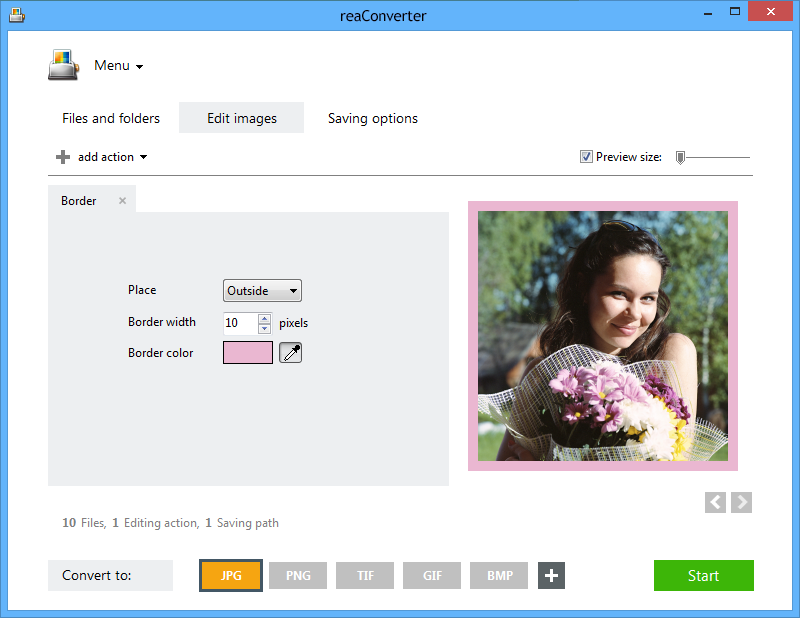 With reaConverter you can add customizable borders to all your images at once, in a matter of seconds. Add all the images you intend to border by picking them manually from a local folder, adding an entire folder or using reaConverter's handy drag-and-drop feature. Here you can decide if you want to have an inside or an outside border to your photos, and pick its color and width. The former can be chosen using a color picker directly on the preview image on the right, which you can see when you tick the Preview button. In the Saving options, select a location where the newly bordered images will be saved. Available options include saving them locally, in the source folder or in a new one. 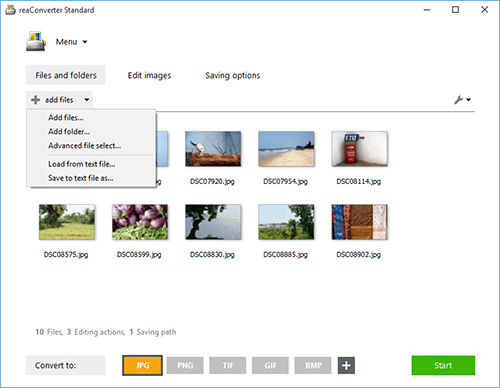 In addition to editing the images, you can also convert them to a new format by simply clicking on one of the buttons placed in the lower part of the screen. 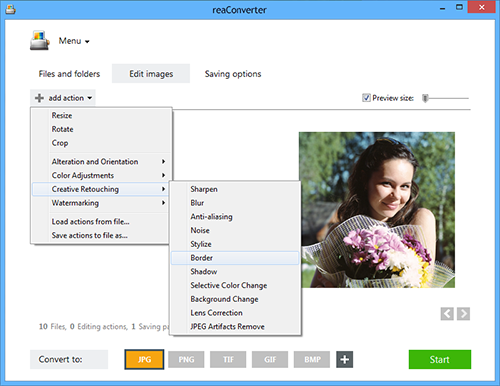 reaConverter offers a full list of image extensions available for conversion, including popular ones, such as JPG, PNG or TIF, but also archaic and rare ones. In case you don't see the desired extension in the bottom part of the window, click the Plus button and more options will appear. After selecting the one you want, simply press Start and your new images will be ready in a few moments! Command-line border tool is an advanced feature meant for professional use, and is available in Pro edition only.